Q. How do I use PowerPoint Presentation Templates? A. Please note that when you insert a template the background and color schemes (accent, hyperlink, fill, font, line, and shadow colors) are all modified to optimize the slide. You can edit the background or color schemes if you so choose. Select "Format" from the Menu bar. 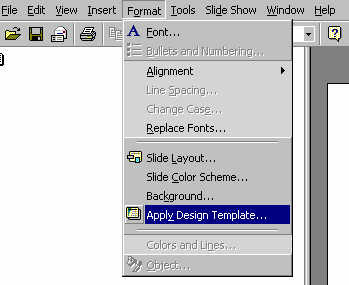 Then, click "Apply Design Template...". See Figure 1. Identify the correct location for the template you wish to use. The location of your template depends upon the drive letter associated with where you saved the file. 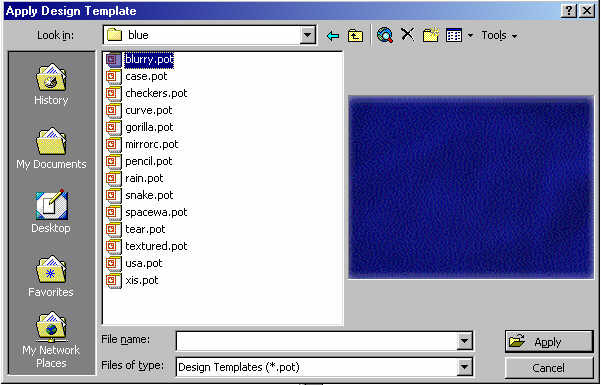 Using the C drive as an example, if you wished to use the blurry template you would do one of the following. Click on Drive Letter "C" > blue > blurry . See Figure 2. You can either double click on the template of your choice or single click on the file and choose "Apply" in the lower right corner of the select picture menu. If you would like to change this template at any time, repeat steps 1-2 and choose a different template. Once the template is correctly chosen, the template will remain the same for each slide you add to the presentation.